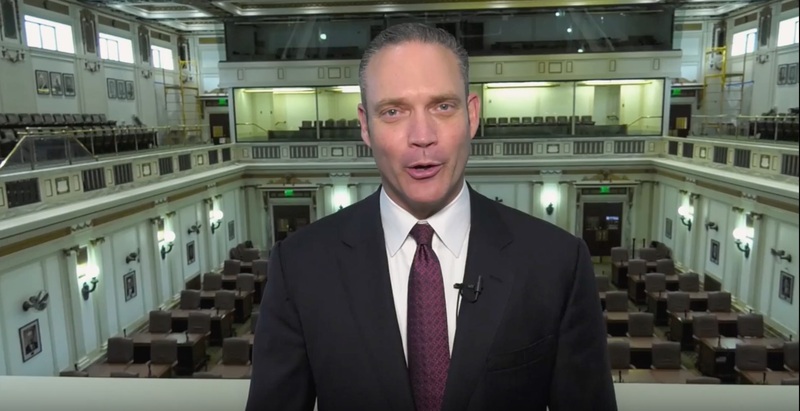 Considering they’re about as popular as Mary Fallin microwaving leftover curry in the teachers’ lounge, one of the big priorities for lawmakers in 2019 is to apparently restore the faith and trust of the Oklahoma people. To accomplish this laughable goal, and try to make Oklahomans forget about all the pain and humiliation they’ve caused this century, they’re pulling out all the stops – from media manipulation to introducing sane and practical legislation to producing incredibly boring hype videos. Check out this video the Oklahoma House released on Monday. It lets us know we are all ONE Oklahoma. In all fairness, I doubt they had a huge budget for the production – and I bet the piece was probably edited and spliced together by some guy who does videography on the side for a LifeChurch.TV ripoff – but that was brutal. It was about as boring as watching Vince Gill eat a bowl of oatmeal! To snazz it up, they should have just used Channel 9’s old Spirit of Oklahoma commercial and shown a video montage of Oklahoma lawmakers working together with lobbyists, donors and conservative special interest groups to craft laws that benefit the rich, hurt the poor, and discriminate against minority groups. That would have been much more honest and relatable. They must have cut out the scene where the lobbyist hands the cash stuffed envelope to the GOPer. Or are these critters so cheap you can buy ’em with a Big Mac and large fries? Fairly awful, cliched video with lots of stark, empty images. Looks like everyone left Oklahoma; and the last person out did, indeed, turn out the lights. The copy sounded like a poorly written 4th grade Oklahoma history project. There was not one original piece of information given. I sincerely hope no one across State lines ever sees this. After the release of various 2018 demographic information for Oklahoma in education, public health, social services, child welfare, equal pay, fair across-the-board taxation and long-range economic health this State doesn’t need any more bad publicity. Is it just me or does House Speaker Charles McCall look like a Mafia Don ? Apologies Mafia Don’s everwhere I realize you do have a code of ethics. The first ugly mug in that video, the one who says “We represent different parts of the state,” may be unfamiliar to those of you who live in the OKC metro. He is Republican and odious jerk Josh West of Grove. He represents the 5th District, which consists of big chunks of Delaware and Mayes counties. Delaware County is presently embroiled in a controversy over the rapid and heavy expansion of chicken farms near the Arkansas border. In response, Mary Fallin and the Cherokee Nation established a “Coordinating Council on Poultry Growth,” which supposedly “includes various agencies, community members, and legislative representatives, which are responsible for analyzing the impact poultry production has had on rural communities and citizens in the region.” Isn’t that special? Whom do you suppose House Speaker Charles McCall appointed to the Council to represent the State House? That’s right: Josh West! Logical, right? Sure it is, since he represents much of Delaware County. Only trouble is, Josh West also happens to earn his very living working for Simmons Foods, one of the main companies responsible for the expansion of poultry farms into Delaware County! How about that! West’s ugly mug also appears near the end of the video saying “We are One Oklahoma!” He says this while simultaneously wearing TWO hats – one representing his employer, and the other representing his constituents whose quality of life is being adversely affected by smell and water pollution that his employer is bringing to their neighborhood. Nice, eh? Wonder whose side West is on…. Socialism, as opposed to the fine capitalists to whom he would gladly sell out his constituents. 😢 crooks isn’t that illegal for him to be working from both sides? What is it who pads his pockets the best! He should be fired and the speaker should be fired for putting him over ot in the first place. This video tells me that the capitol is the people’s house. I take this to mean the people are welcome there, just like the lobbyist is welcome there to tell their side of the story. However it appears the people are welcome, as long that number doesn’t exceed 100. Senate Bill 592 proposed by Mark Allen require that any protests over 100 people post a $50,000 bond for cleanup of the event. While it is the people’s house, in Sen. Allen’s world, only 100 at a time. I can only assume he doesn’t share the beliefs of the other representatives in this video. They also did say the capitol was “the teachers’ house”, so if the bill is passed, it is their house, but only for 99 at a time. I’m guessing the tourism department had something to do with the video, and sadly the budget was probably much more than it had any reason to be. It is funny to watch this total BS video after viewing some of the party pics from Speaker McCall’s “Let them eat cake” prom party at the Cowboy Hall of Fame. Oklahoma, is this a great state or what? Thanks for the info, Graychin. I thought those type of ethics were limited to NW Oklahoma. Boy, was I wrong! And now I’m pissed. Did the Ralph Shortey clip get left on the cutting room floor? They show different parts of the state, a shot of Shortey in McAlester would have been appropriate.